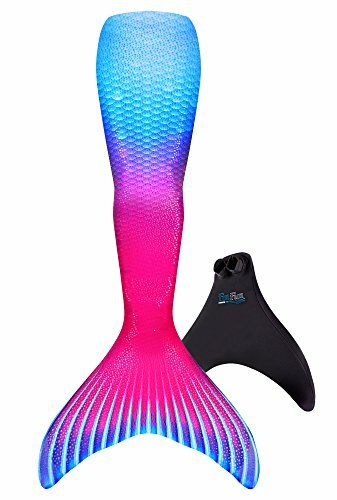 The Fin Fun Monofin includes an engineered flexible, unbreakable polypropylene insert with a dive grade neoprene cover; not a flimsy piece of plastic with uncomfortable elastic. Designed for maximum propulsion, while maintaining a mermaid shape. Feet are not strapped in, making removal in the water easy; a tug, a kick and you're out! Swimsuit tail fabric stretches around Monofin. Exclusive fabric designs look like real scales on land and magical mermaid scales in the water! Please measure your mermaid to ensure accuracy in sizing. Waist measurements are measured at the waist. Hips are measured around the fullest point in the hip area. Length measurements are measured from the waist to floor. Only for experienced swimmers ages 6 and up, not a flotation device, adult supervision required. Machine washable gentle cycle cool water, hang to dry. MACHINE WASHABLE! Machine wash cold, tumble dry low. Do not bleach, iron, or dry clean. If you have any questions about this product by Fin Fun, contact us by completing and submitting the form below. If you are looking for a specif part number, please include it with your message.